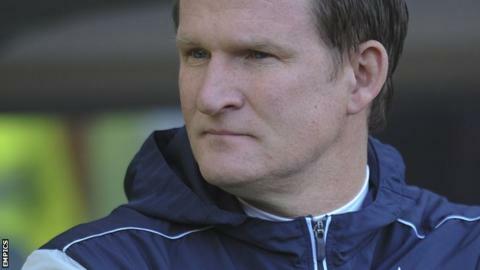 Simon Grayson believes a 1-1 draw at Swindon was a satisfactory start to his reign as Preston North End manager. "Everybody probably expected a home win on the coupon. The one mistake we made in the game led to the equaliser," Grayson told BBC Radio Lancashire. "They showed a lot of effort and desire to not get beaten. We played some decent stuff at times. He added: "It's a transition of different managers and different playing styles. The players have been very receptive to what we've been trying to do over the last few days and you saw that there's a desire of a group to do better than they have done already this year." North End are 18th in the table, seven points above the relegation zone. Grayson, who on 18 February, has won promotion from the third tier with three different clubs and wants to achieve the feat again with Preston. He added: "All I can do is affect the future and what we're trying to do for the rest of the season. "We've got some difficult games coming up but the players seem to thrive on it. "The players have got a buzz about them. Only time will tell if this group is good enough to get us up the divisions, but we're working hard with them to try and achieve that." Meanwhile, striker Stuart Beavon is set to feature against MK Dons on Saturday. He was forced off at the County Ground with an arm injury but Preston do not think the problem is serious.